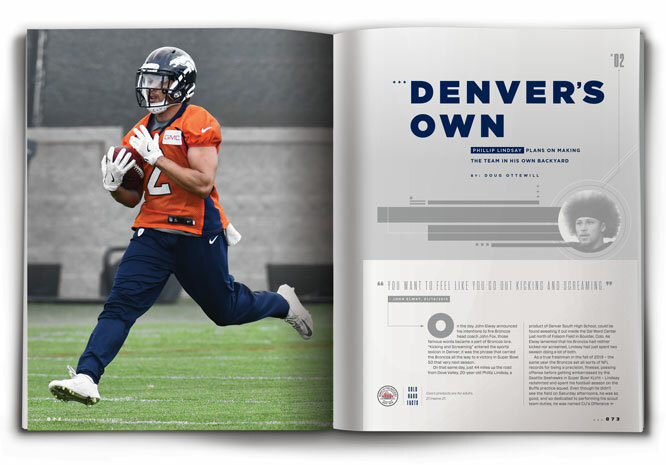 *With Phillip Lindsay officially making the Broncos’ 53-man roster this weekend, we flashback to this story from the August issue of Mile High Sports Magazine. Subscribe here! On the day John Elway announced his intentions to fire Broncos head coach John Fox, those famous words became a part of Broncos lore. 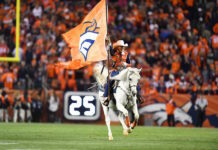 “Kicking and Screaming” became the preferred lexicon in Denver, a phrase that carried the Broncos all the way to a victory in Super Bowl 50 that very next season. 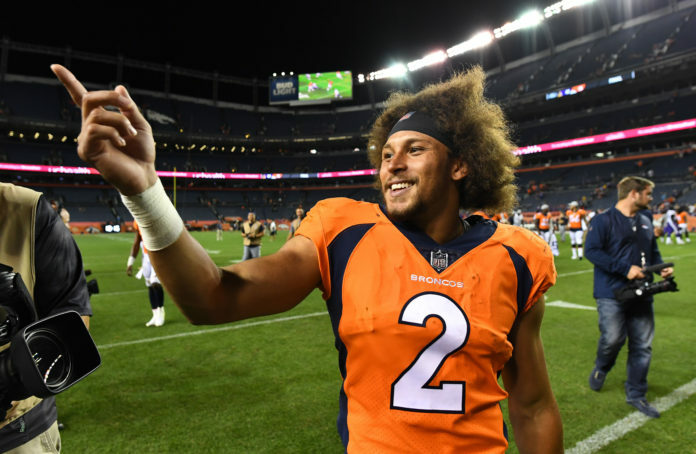 On that same day, just 44 miles up the road from Dove Valley, 20-year-old Phillip Lindsay, a product of Denver South High School, could be found sweating it out inside the Dal Ward Center just north of Folsom Field in Boulder, Colo. As Elway lamented that his Broncos had neither kicked nor screamed, Lindsay had just spent two season doing a lot of both. As a true freshman in the fall of 2013 – the same year the Broncos set all sorts of NFL records for being a precision, finesse, passing offense before getting embarrassed by the Seattle Seahawks in Super Bowl XLVIII – Lindsay redshirted and spent his football season on the Buffs practice squad. Even though he didn’t see the field on Saturday afternoons, he was so good, and so dedicated to performing his scout team duties, he was named CU’s Offensive Scout Player of the Year as selected by the coaches. The next season, Lindsay’s first on the Buffs active roster, he played in all 12 games and racked up 1,358 all-purpose yards, he shattered the previous freshman mark by over 400 yards. Lindsay’s bite was even bigger than his bark though. He backed up every fisticuff he ever entertained, and last winter, when his college career as a Buff was over, he stood as Colorado’s all-time leader in all-purpose yards with 5,760 and yards from scrimmage with 4,683, a two-time captain and an Honorable Mention All-Pac-12 running back. Yet, he wasn’t even invited to the NFL Combine, nor was he drafted by a single team. Even John Elway, a man who claimed to value kicking and screaming, didn’t select Lindsay in the draft. 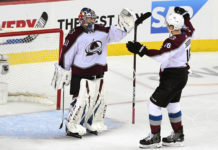 He did choose him – eventually – signing the Colorado native to a free agent contract on May 1. Phillip Lindsay’s answer is definitive. His eyes are focused upward, looking somewhere along the ceiling. He’s lying with his back flat on the turf, his right leg is contorted across his body, completely perpendicular to his left. There’s a long rubber band strapped around the sock on his right foot and its being stretched all the way back across his body, pulling his leg in the direction of his head. It looks unnatural for the ultra-compact Lindsay, who still stands at 5-foot-8, but now tips the scales somewhere around 190 – all muscle, no doubt. This is typical of his cool down and stretching routine at Landow Performance in Centennial, where, as he’ll tell you, he went to “get right” after a grueling senior season at CU. Last fall for the Buffs, Lindsay racked up a total of 324 touches, and despite the hefty workload, never once fumbled. His 301 rushing attempts set a school single-season mark and also tied for the most in the country. Aside from getting his body right, Landow Performance is where he went to prepare for his NFL Pro Day, where he turned in the kind of numbers worthy of the Combine invite he never received – but, back to that shortly. “Jordan” is Lindsay’s answer to a classic sports debate: Jordan or Lebron? During the stretch, the conversation between Lindsay and his trainer, Augie Agyei, shifts to the NBA playoffs, which have just kicked off. A couple nights prior, LeBron James and his Cavaliers lost their opening game – at home – to the Indiana Pacers. James tallied 24 points and 12 assists, but it wasn’t enough. The unexpected loss has Agyei, a product Aurora’s Smoky Hill High School, Drake and CSU-Pueblo before playing for the Cincinnati Bengals and Utah Blaze of the Arena League, and Lindsay talking hoops. Anyone’s answer to the Jordan versus LeBron debate can help to define who that person is. It’s not so much which player they prefer, but why they prefer him. Lindsay, who was born in 1994, wasn’t around for Jordan’s first three NBA titles, and was just four-years-old when Jordan collected his sixth ring. Lindsay wasn’t quite five when the movie Space Jam hit the theatres. Without a doubt, Lindsay has seen far more of LeBron’s career than Jordan’s. Still, he prefers His Airness to The King. Lindsay isn’t discounting LeBron because of the recent loss. More so, he’s tipping his cap to history – Lindsay has an appreciation for that. He’s got a healthy respect and admiration for those who have gone before him; it’s obvious when he speaks. His mother, his father and is Uncle Tony, who coached him at South, they’re all huge influences in his life. Darian Hagan, a Colorado Sports Hall of Famer, one of the greatest Buffs to ever play and Lindsay’s running backs coach, is a mentor that Lindsay says “was like another father to me.” Hagan can’t count the number of times Lindsay would catch him inside the office at all hours, hoping the coach could spare some time to answer questions that came up during film study, or maybe just talk about life in general. Even the night janitors at CU’s new and massive training center, they’re important, too. During his days as a Buff, Lindsay was notorious for late night workouts. Inside the cavernous facility, at all hours of the night, would be just him and the staff on graveyard shift. Between reps, he’d chat with them like they were his teammates. He noted their importance. He was appreciative of what they did, when they did it and the role they played in the success of CU’s athletic teams. On Saturday afternoons, Lindsay was the one who got all the attention. On a random Tuesday night around midnight, he was the one paying attention to them, regularly taking notice of exactly what the cleaning crew was doing. Not every, potentially-entitled, millennial, All-Conference Division I athlete makes such conscious observations. And while he might consider Jordan to be the greatest of all time, it’s probably Denver’s own Chauncey Billups who provides the answer to the question, “Who’s your favorite?” After all, Chauncey, like Lindsay, is a son of Denver – that’s an identity, a brotherhood of sorts, that Lindsay holds dearly. Chauncey is also a role model, so when the King of Park Hill sent out a tweet immediately following Lindsay’s last game as a Buff – “You a beast @I_CU_boy. You brought us some great moments the last few seasons. You put on for our city, and state. Can’t wait to see you on the next level. #salute #sko” – it meant the world to Lindsay. But loyalty and respect and good manners don’t necessarily get someone all the way to the NFL. That has more to do with those aforementioned Pro Day numbers. Lindsay ran a 4.39 second 40-yard dash, which would’ve placed him second among all 32 running backs at the NFL Combine. His 4.39 was only bested by North Carolina State’s Nyheim Hines (4.38). Penn State’s Saquon Barkley, who was ultimately the No. 2 overall pick in the draft, posted a 4.40-40. Lindsay’s 35.5-inch vertical leap would’ve tied him with Hines for ninth among combine participating running backs. Royce Freeman, who was given the nod as the Second-Team All-Pac-12 running back and drafted in the third round by the Broncos, jumped an even 34 inches. The stopwatch on Freeman read 4.54 following his 40 time. The most important stats – at least presumably to NFL scouts – tied to Lindsay? His height and weight: 5’7 and 2/8” and 184 pounds (as it reads “officially” in his Pro Day report). It’s a fact, that Barkley, who’s not that much taller (5-foot-10) but considerably beefier (233 pounds), and possesses similar combine scores, is naturally more appealing than the smaller Lindsay. Barkley will step in on day one of camp as the Giants’ starting tailback and he won’t be asked to do much else. “Instead of looking at whether or not I can play football, people tried to view me as what I lack, which is a prototypical NFL body. But you know what? I love myself, and not ashamed of how God made me,” Lindsay wrote in an essay titled “Trusting God’s Plan” on athletesforGod.com. The position he’s in, as it turns out, is one of six running backs (counting fullback Andy Janovich) trying to make the Denver Broncos’ roster. 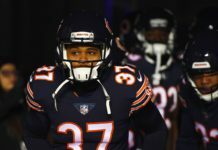 He’s a local favorite – everyone is rooting for Lindsay – but as it pertains to the NFL, he’s just another rookie, trying to earn the same kind of respect he sought as a freshman in college. And in his case, he’s an undrafted free agent, trying desperately to extend his football career by one carry, one practice, one day, one game, one season. 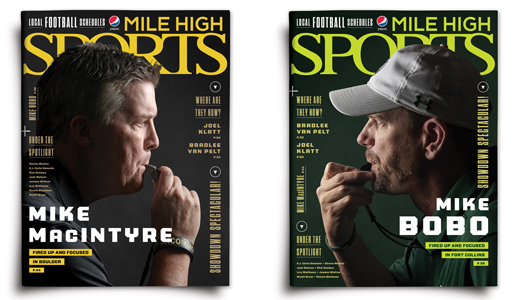 “I believe Phillip will make the roster,” says Mike MacIntyre, Lindsay’s head coach at CU who spent five seasons as an NFL assistant coach with the Cowboys and Jets from 2003 to 2007. “Personally, I think he can play running back at the next level – he’s got what it takes. But I believe he’ll make the team because he can be a valuable contributor on every single special teams unit. He had such great junior and senior seasons as a running back for us, people forget that when he was younger we put him all over the field on special teams. He just makes plays. Hagan compares Lindsay to Eric Bieniemy, who, following his college career at CU, went on to have a nine-year career in the NFL with the Chargers, Bengals and Eagels. “He’s fiery like Bieniemy was. He’s not going to back down to anyone,” says Hagan. “You can’t take that out of a guy like that. That’s his edge. No matter what people say, or what they know about his past or his personality, or how much they like him, Lindsay is well aware that the NFL is a business. He knows it comes down to earning his spot, something he’s had to do before. Not having things handed to him is how it’s always been. He’ll apply the same lessons he learned as a redshirt freshman. For the time being, Lindsay is living with his parents – perhaps more accurately, living in the gym, living in his playbook and living in the film room. He’s not ready to splurge on his own house; he’s wise enough to know that nothing is a lock for him, even in Denver. “I love pressure,” he says. “All it does it bring out the animal and demon in me. All it does is shelter me up and it makes me stay more focused than somebody who thinks that they have it. “For me quite frankly, drafted or undrafted, I don’t think there’s another running back that can do the things that I can do. Kicking and screaming all the way, no doubt.